As with many other food additives, the safety of using caramel color is a controversial subject. Because it can be derived from wheat, you might be wondering if it's okay to consume this ingredient when you're following a gluten-free diet. A color food additive used in cola soft drinks like Coca Cola, Pepsi, and other dark sodas, caramel color may pose health risks. However, more research is needed to know for sure. This additive is made by heating sugars (usually derived from corn) and sometimes adding extra ingredients in a process called caramelization. During the production process, a chemical called 4-methylimidazole is often formed. The chemical 4-methylimidazole found in caramel color may be a cause of concern (in large amounts) in people at risk for cancer. The U.S. Food and Drug Administration (FDA) says consuming 4-methylimidazole at levels found in foods and drinks don't pose short- or long-term dangers. However, Consumer Reports says one study found 4-methylimidazole caused cancer in mice, and suggests humans limit this potentially harmful ingredient as much as possible. What About Allergies and Gluten Sensitivity? Chances are, caramel color won't bother you if you have gluten sensitivity or food allergies, but use caution if you have severe allergies. Caramel color is made from different types of sugars, and it's possible some of the sugars are derived from milk or wheat. If you have a severe milk allergy, the University of Rochester Golisano Children's Hospital says to avoid caramel color. But, the Celiac Disease Foundation says if you're following a gluten-free diet you don't have to avoid caramel color because it's usually derived from corn. When in doubt, look for products labeled gluten-free. There isn't an established safe limit for 4-methylimidazole consumption as more research is needed. However, a 2015 study published in Plos One says the state of California requires foods and drinks containing 29 micrograms or more of 4-methylimidazole to carry warning labels. Consumer Reports suggests limiting 4-methylimidazole to a maximum of 29 micrograms or less daily because of the potential for increased cancer risks. While more research is needed to determine a safe amount of caramel color, the best recommendation is to consume drinks containing this food additive in moderation. 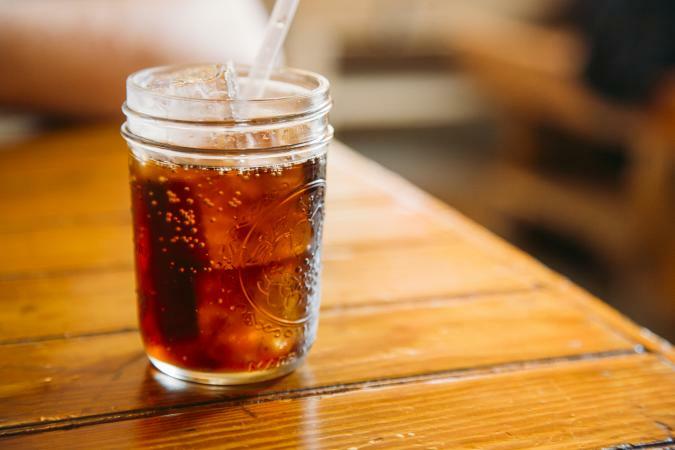 Limit brown-colored soft drinks to 12 ounces or less daily and choose those containing less than 29 micrograms of 4-methylimidazole per serving to keep cancer risks at a minimum. Can you safely consume caramel color products if you are on a gluten-free diet? The Celiac Disease Foundation says yes as caramel color products are likely derived from corn (vs. wheat) in the United States. Tricia Thompson, MS, RD, also says caramel color is okay to consume if you're following a gluten-free diet (even if it's derived from wheat). However, when in doubt, avoid it. Most drinks containing caramel color (primarily sodas) aren't a healthy choice anyway.